When this weighty tome thumped through my letter box (actually, it wouldn’t go through my letterbox, the postie delivered it right into my hands) I was somewhat overwhelmed by the sheer size and weight of the book. I read a little about the author: “Professional chef Madalene has worked at some of the country’s finest restaurants, from Aubergine (as part of Gordon Ramsay’s brigade) and Claridges, and under Michel Roux Jr at Le Gavroche…” blimey, this is a serious chef, how on earth am I going to make anything from a book by such a high powered chef? However, reading on I found that Madalene and her partner Ross Pike had created a website to show off their love of seasonal produce, this led to them opening their Award winning Pub, The British Larder in Suffolk. This gave me a little courage to think that perhaps there might be some recipes which suited my home cooking style. Oven Roasted Acorn Squash with Salt-baked Beetroots and Rosehip and Elderberry Vinaigrette, Slow Roasted Pork Belly with Crab Apple Jelly and Caramelised Damsons, Hedgerow Fruit Pastilles (yes, pastilles as in ‘sweets’). Red Wine-poached Quinces and Goats Cheese Open Filo Tarts with Salted Caramel Walnuts, Pot Roasted Mallard with Cider Apples and Celeriac Mash, Apple Snow with Warm Honey Madeleines. Sage, Prune and Armagnac-stuffed Turkey Breast with Prune Sauce, Beef and Oyster Pie, Chocolate and Cranberry Salami. I got a copy of the Readers Digest Cookery Year when I was in my early twenties, I learned a lot about seasonal cooking and eating from that book. It was also a great reference and source of techniques. 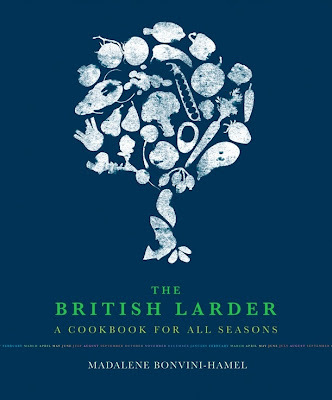 I think The British Larder could act in the same way for a cook who is keen to learn and would like to create ambitious dishes. It is also good for those of us who would like a reminder and some fresh inspiration to cook seasonally. I noticed there are quite a few ‘game’ recipes in this book. Probably more than I have seen in a cookery book that is not devoted to game. So if you like to cook and eat game you will find lots of inspiration and interesting recipes for venison, partridge, pheasant, woodcock and rabbit. I loved the dessert recipes, although Madalene claims not to be much of a pastry chef, the flavour combinations would certainly suit my taste. Preserves, cordials, pickles and chutneys also feature in many of the chapters with inspiring flavour combinations. There are quite a few inspired vegetarian dishes, but they are heavily outweighed by meat/fish/poultry recipes, so I wouldn’t recommend The British Larder for vegetarian or vegan cooks. The recipes are well written and comprehensive; many of them feature useful ‘Cooks Notes’ with substitutions or additional ideas relating to the recipe. I would have liked to make one of the imaginative and ambitious dishes that I've described, but in the end I decided to choose a classic to show you just how detailed and well written these recipes are, to the extent that I felt very comfortable adapting the ingredients to make some mini tarts. Whizz the sourdough bread in a food processor to make fine breadcrumbs. Set aside. Whisk the egg and cream together in a small saucepan, just enough to make them runnier and easier to mix. Remove from the heat. Whisk the warmed golden syrup and honey and lemon zest and juice into the egg mixture, then stir in the ground almonds and breadcrumbs. Dover and leave the mixture to rest in the fridge overnight. The following day, roll out the pastry on a lightly floured work surface to about 2mm thickness and use it to line a (loose-bottomed, if you like) 35 x 10 x 2.5cm fluted oblong flan tin (leaving a slight overhang of pastry). Leave to rest in the fridge for 30 minutes. Meanwhile preheat the oven to 160C/Gas Mark 3. Whisk the chilled breadcrumb mixture and pour it into the chilled pastry case. Bake in the oven for 40-45 minutes or until lightly set and golden - the tart will still have a gentle wobble in the centre but his will firm up once cooled. Remove from the oven to a wire rack and leave the tart to cool completely in the tin. Once cold, trim the overhanging pastry from the top edges of the tart with a small serrated knife, then carefully remove the tart from the tin and cut it into slices. Serve with whipped Chantilly cream, creme fraiche or vanilla ice cream. I recommend using an oblong fluted flan tin instead of a round one for this recipe , so that the tart cooks more evenly and is easier to cut and handle. Use fresh bread that is a day old, cut the crusts off and the inside of the load only. Can can use regular white bread for the recipe, but I prefer sourdough as it gives the tart that extra special taste. Do not use dried breadcrumbs. Be patient when making this tart and follow the recipe - leave the breadcrumb mixture to rest overnight in the fridge, do not overcook the tart, and leave it to cool completely before cutting and eating. Wrap the pastry in cling film (either wrap it as one piece, or divide it into tow pieces and wrap each piece separately) and then leave it to rest in the fridge for 30 minutes before rolling out. (I like to shape the pastry into flat even square (s) so that they fit comfortably into my fridge or freezer.) Freeze the pastry you are not using an use within 3 months. Defrost overnight in the fridge before use. 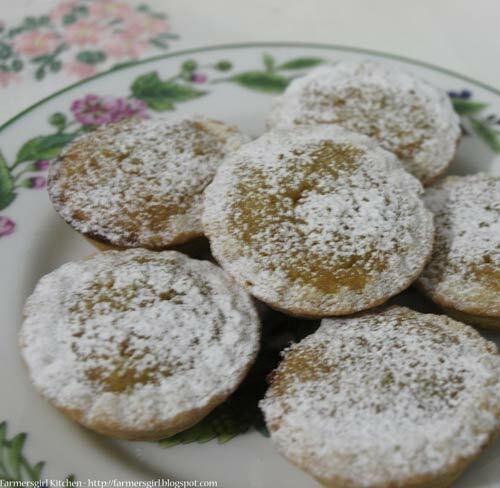 For the dozen mini treacle tarts, I used about 300g of pastry, 50g breadcrumbs, half an egg, 60g double cream, 15og golden syrup, 1/2 a lemon and 30g of ground almonds. 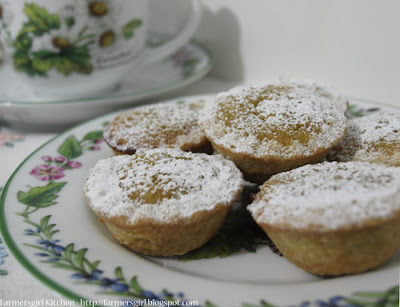 Recipe Review: Lots of people seem not to like dried fruit, so I made these as an alternative to mince pies and they worked very well. I was a little disappointed with the vanilla seeds in the pastry as I didn't feel that there was a real hit of vanilla, so would boost it with vanilla sugar. Great idea though. The pastry is very soft even after a night in the fridge and not particularly easy to work with, I think I prefer my standard recipe but might try adding vanilla. The Treacle Tart mixture is a real triumph, easy to make and tastes very good indeed. This is an expensive book, even with on line discount prices, but I think it is good value for money and likely to become a new classic for British cooks, chefs and foodies. I was provided with a copy of The British Larder by Absolute Press/Bloomsbury Publishing, I was not required to write a positive review and my opinions are my own. Glad the review was helpful to you, it's a great read! These sound really, really delicious. I'm a golden syrup fan so love any recipe which highlights it. Thanks for the review Janice. I love the website, which hardly features any meat on it, so it was a bit disappointing to find the book is heavily weighted in that direction. A book divided into sections according to what is available during the month, that sounds very good.